An artist's illustration of the star system HD 98800, which features a pair of stars orbited by a vertical planet-forming disk of material. Planet-forming disks of material typically orbit around the equators of stars, but now scientists have discovered such rings can go dramatically awry and encircle the poles of stars instead. The new study suggests that worlds could exist with polar orbits around pairs of stars, potentially leading to seasons extraordinarily different than Earth's. Prior work found that nearly all young stars are initially surrounded by protoplanetary disks. 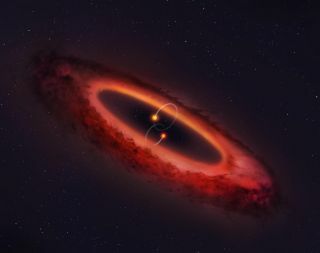 In the case of protoplanetary disks around single stars, at least a third go on to form planets, said lead study author Grant Kennedy, an astronomer at the University of Warwick in England. However, computer simulations have previously suggested that after protoplanetary disks have formed, any extra material they collect can knock them off-kilter. This could explain why astronomers have detected exoplanets with relatively crooked orbits around stars. Kennedy and his colleagues focused on so-called circumbinary planets, which orbit around binary stars. Scientists had suspected that planets around binary stars could become misaligned — instead of orbiting the stars in the same plane in which the stars orbit one another, these worlds could orbit around their poles instead. Now, Kennedy and his colleagues have detected the first example of a misaligned circumbinary protoplanetary disk. "It's one of those examples that nature manages to be more creative than we expect," Kennedy told Space.com. The scientists focused on the quadruple-star system HD 98800, located about 146 light-years from Earth. "If planets were born here, there would be four suns in the sky," study co-author Daniel Price of Monash University in Australia said in a statement. Previous research confirmed the way in which these binary stars orbited one another. The new study revealed the protoplanetary disk around these stars essentially orbited around their poles, like a Ferris wheel with a carousel at its center. "I wasn't actually expecting these data to reveal a polar configuration," Kennedy said. "Based on previous results, I had made all these predictions of complicated warped structures, but they turned out to be completely wrong. The end result is much simpler and more compelling." A planet embedded in the protoplanetary disk of the star system HD 98800 would get this striking view of the disk and pair of stars. These new findings suggest that circumbinary planets in polar configurations may prove more common than often assumed, Kennedy said. "The disks exist, so why shouldn't the planets?" he said. Such a planet might also experience unusual seasons, Kennedy said. "For Earth, the seasons happen because of the tilt of the Earth's axis," he explained. This leads the amount of daylight each hemisphere gets each day to grow or shrink over the course of the year, and this influences how warm or cold they are, he said. With any planet that might evolve in HD 98800, axial tilt is not the only potential factor underlying seasonal variations. "The stars will also change their height in the sky as they orbit each other," Kennedy said. Depending on the season, "sometimes there would be two suns during the day, sometimes one." The scientists detailed their findings online today (Jan. 14) in the journal Nature Astronomy.